"Trios" is one of the outstanding jazz albums of the season and marks the first time that a new Carla Bley album has appeared on ECM itself. Carla, Andy Sheppard and Steve Swallow revisit classic Bley compositions in an exceptional album recorded in Lugano in April of 2012 by Manfred Eicher. Included here are spirited new versions of “Utviklingssang” and “Vashkar”, and the suites Les Trois Lagons, Wildlife and The Girl Who Cried Champagne. Carla’s robust tunes are vividly conveyed, all members solo compellingly, and the trio has never sounded better. Though Carla Bley's drummerless trio with saxophonist Andy Sheppard and bassist Steve Swallow has been a running concern for 20 years, they've not recorded together as such since 1995's live album Songs with Legs. 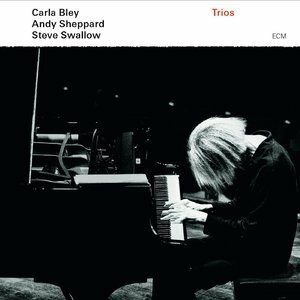 Trios also marks a pair of firsts for Bley: it's her debut for ECM proper (she has recorded on the label-distributed Watt since 1974), and her initial date as a leader with another producer at the helm; in this case, Manfred Eicher. While no one was going to dictate arrangements to Bley, she did allow him the choice and sequencing of material. These five selections are new versions of works that have been recorded by other ensembles – three of which are suites. They reveal just how adaptive the composer and arranger is in any setting. Take for example, the closing three-part suite "The Girl Who Cried Champagne," first recorded for 1986's Sextet, then in a big-band arrangement for 1988's live Fleur Carnivore. Here she carves out plenty of room for the trio's individuals to let their imaginations roam. It commences with a lithe bossa groove, intersects with French cafe music, balladry, swinging, snappy, post-bop, and back again with Bley threading the melody through it all. Sheppard's dry phrasing (suggesting Paul Desmond) but upbeat lyric emotion, showcases the wry humor in Bley's writing, while Swallow displays the songlike nature in her work. Bley finds moments of dissonance and angularity within without derailing the overall bounce. "Vashkar" dates from the early '60s. It was first recorded by Paul Bley, and then covered by many more. It is most often associated with the more frenetic, electric readings by Tony Williams' Lifetime, and John McLaughlin and Carlos Santana. This version is radically different than any one previously. Here, its delicate, near droning Middle Eastern modal melody is given room to breathe and inform the rest of the tune. Sheppard's soprano dances around her piano as she slowly extrapolates on the vamp, while Swallow plays a near hypnotic riff throughout. It's elegant, graceful, poetic. The most impressive piece here is the "Wildlife" suite, originally written for the octet that appeared on 1985's Night-Glo. The twin melody lines carried by Sheppard and Swallow, with Bley doubling chords and inserting melodic fills, erases the notion of a greater number of players. Even as it shifts tempo and becomes busier and more labyrinthine, its sense of intimacy and intense focus never dissipates – Swallow's playing in it is revelatory and crosses the keyboard to simultaneously filling and opening up harmonic spaces. Trios offers more than just re-arrangements of some of Bley's classic tunes with a smaller group; it portrays how timeless she is as an artist, and just how integral is her role in the development of modern creative jazz. Produced by Manfred Eicher. Engineered by Stefano Amerio. Recorded in April 2013 at Auditorio Radiotelevisione svizzera, Lugano.